Pictured here is Charlie Goodberlet from Manchester, NY. 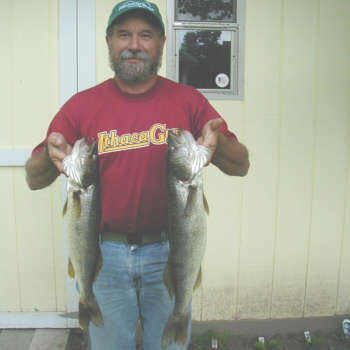 It was near the end May 2005, when he and some friends were fishing on Honeoye Lake. They were fishing for panfish using ultra light tackle with 4 pound spider wire. Charlie was using a 1/16 oz yellow Bass Pro Maribou jig tipped with a small piece of worm. They were having a great time with the panfish and also managed to catch these two nice walleyes as a bonus. They measured in at 21 and 24 inches. They gave the ultra light tackle a very good work out. Honeoye Lake is 4.5 miles in length and has a maximum depth of 30 feet. The lake is just over 3/4 of a mile wide. Honeoye Lake is a warmwater fishery with the primay species of fish being walleye, largemouth bass, smallmouth bass, chain pickerel, bluegill, pumpkinseed, yellow perch, rock bass, and black crappie. Walleye are the only species stocked into the lake by the DEC with over 8 million walleye fry stocked here annually. The great walleye fishing that New York State has to offer is in large part due to the efforts of the Oneida Fish Hatchery. Oneida Lake provides all of the walleye eggs for New York's stocking program. Each year DEC produces approximately 300,000 pond-reared, 190,000 intensively reared, and 190,000,000 walleye fry to be stocked into more than 50 diffrent bodies of waters across the state. Most of the states man made reservoirs also contain walleyes and the current state record walleye was caught from the Kinzua Reservoir 05/22/94. It was caught by John D. Fluder on a Mr. Twister and weighed in at 16 lb.7oz.